Circulation Pathways- Systemic And Pulmonary Circuits. 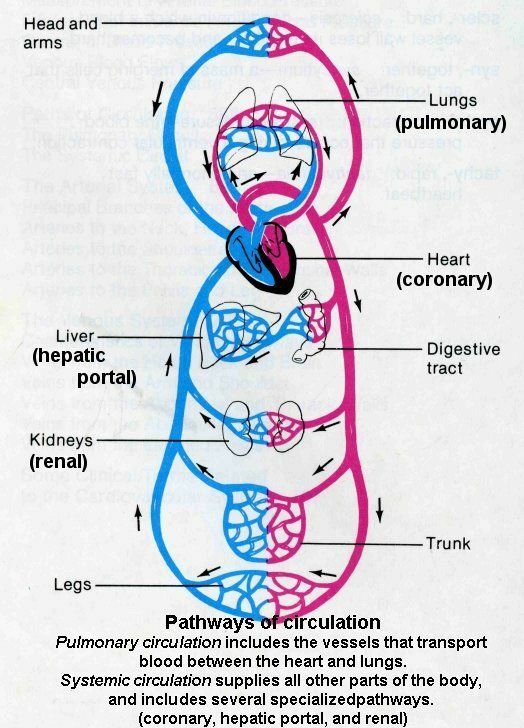 Physiology ▶ Cardiovascular System ▶ Circulation Pathways- Systemic And Pulmonary Circuits. The heart is a double pump that serves two distinct circulation pathways: the pulmonary and systemic circuits. The pulmonary circuit carries deoxygenated blood to the lungs, where oxygen and carbon dioxide are exchanged between the blood and the air in the lungs. The right ventricle pumps deoxygenated blood into the pulmonary trunk, a short, thick artery that divides to form the left and right pulmonary arteries. Each pulmonary artery enters a lung and divides repeatedly to form arterioles, which continue into the alveolar capillaries that surround the air sacs (alveoli) of the lungs. Oxygen diffuses from the air in the alveoli into the capillary blood, and carbon dioxide diffuses from the blood into the air in the alveoli. Blood then flows from the capillaries into venules, which merge to form small veins, which, in turn, join to form progressively larger veins. Two pulmonary veins emerge from each lung to carry oxygenated blood back to the left atrium of the heart. The systemic circuit carries oxygenated blood to the tissue cells of the body and returns deoxygenated blood to the heart. The left ventricle pumps the freshly oxygenated blood, received from the pulmonary circuit, into the aorta for circulation to all parts of the body except the lungs. The aorta branches to form many major arteries, which continually branch to form arterioles leading to capillaries, where the exchange of materials between the blood and interstitial fluid takes place. Oxygen diffuses from the capillary blood into the tissue cells, while carbon dioxide diffuses from the tissue cells into the blood. From the capillaries, blood enters venules, which merge to form small veins, which join to form progressively larger veins. Ultimately, veins from the superior body (head, neck, shoulders, upper limbs, and superior trunk) join to form the superior vena cava, which returns blood from these regions back to the right atrium. Similarly, veins from the inferior body (inferior trunk and lower limbs) enter the inferior vena cava, which also returns blood into the right atrium. The coronary sinus drains the blood from the myocardium into the right atrium.